When it comes to wall sconces, there are many options available at a wide range of prices. The style of sconce that you select is possibly the most significant choice. However, the power supply you plan to use may inform the style that you opt for. Wall sconces offer many benefits as both indoor and outdoor light sources. Many homeowners appreciate the soft light that wall sconces create. As compared to much overhead lighting, they offer a soft light that creates a particular type of ambiance. Sconces are excellent light sources in that they created the ambiance many consumers prefer with lamps, as compared to overhead lighting, without taking up any floor or table space, the way that lamps do. It’s almost like having the best of both worlds. When considering wall sconces for your home, you may choose from among several power sources. The choice of a power supply is a significant one because it may dictate where you place the sconce. Conversely, where you want to place the sconce may affect your choice of power source. The power source can also contribute to the overall look of your sconce. Wall sconces are available with three major types of power sources: hard wired, plug-in and battery operated. Some wall sconces are designed to hold candles, so this may be another option. Hard-wired wall sconces are a popular choice. They are convenient to operate and offer a polished look for your room. “Hard-wired” means that these light fixtures are connected to the internal electrical wiring of your home, like standard overhead lights. Hard-wired sconces offer the advantage of being easily operated with a light switch. They light the room a lightbulb—there are various options available. However, you will have to replace the bulb occasionally, as with any lighting fixture. Hard-wired wall sconces, although they offer a polished, finished look to any room, may mean that you are somewhat limited in where you are able to install them. Another choice for the power source of your wall sconces is to purchase plug-in sconces. You might think of these as simple table lamps that have been redesigned and mounted to the wall. As you might guess, plug-in sconces work by using a traditional electrical cord that plugs into an outlet in your home. The benefit of plug-in sconces is that you, in some ways, have more options for where you can install them, as they don’t connect to your home’s electrical wiring. However, they still have to be placed near enough an outlet that the cord will reach. Some consumers prefer the look of hard-wired sconces over that of plug-in sconces, as the cord is generally visible when you use plug-in sconces. This can create a less polished look. Some plug-in sconces, however, incorporate design elements that work to disguise the cord. Plug-in sconces are possibly less convenient to operate, as they cannot be turned on and off with the flip of a light switch. Instead, they are controlled by a switch on the fixture itself or by just unplugging the cord. Like hard-wired sconces, plug-in sconces use a lightbulb as the light source, so you will need to replace the bulb periodically. Another option you may want to consider is the battery-powered sconce. Although this is a less popular choice, battery-powered sconces offer many benefits. Battery-powered wall sconces offer the distinct advantage of being easily hung almost anywhere. You are not limited by having to place the sconce near a power outlet, nor are you limited by the strictures of your home’s electrical systems. The batteries, however, will need to be replaced from time to time, which means that battery-powered sconces will require more effort and the ongoing expense of purchasing batteries in addition to light bulbs. This expense is offset to some degree by the fact that battery-powered wall sconces are often less expensive than hard-wired and plug-in options. Wall sconces that serve as candle holders may be the best choice for you. Because these are wall mounted candle holders, they offer the convenience of not being tied to a power source. Some consumers prefer the ambiance that candlelight offers, as compared to electric light sources. Wall sconces that work as candle holders have the benefits of being less inexpensive in that you aren’t using power and purchasing batteries. You can even avoid the hassle of replacing the candles by opting for battery-operated candles, a safe and beautiful alternative. As discussed below, some outdoor wall sconces are solar powered. This is a good choice for energy efficient outdoor lighting. Your power needs may dictate the styles of sconces that work for you. However, with such a wide variety of styles and designs on the market, there is sure to be a wall sconce for you. Not all power sources will work for all types, however. An outdoor, solar-powered sconce is going to require a very different type from a sconce that serves as a candle holder, for example. The main types of wall sconces include armed sconces, flush mounted sconces, wallchieres and spotlight sconces, but there are other types available as well. An armed wall sconce is a sconce in which the light itself is attached to a plate mounted to the wall via an arm. In some cases, the arm is stationary, but some fixtures allow you to swing, swivel and adjust the arm to customize the direction of your light source. Armed sconces seem to be the most popular type of wall sconce, with many different styles available from traditional to contemporary and everything in between. Another type of wall sconce that’s widely available is the flush mount sconce. As the name suggests, a flush mount sconce is a type of sconce in which the sconce itself is mounted flush with the wall, as compared to an armed sconce, which distances the sconce itself from the wall and mounting plate. Flush mounted wall sconces are relatively compact and low profile. They tend to create the feeling that the wall upon which they are mounted is washed with a gentle expanse of light. Flush mount sconces are not the best choice for your primary light source in a room, but they can be lovely accent lights. Wallchieres are distinguished by the decorative elements of the fixture itself. If subtle and low-profile is what you are looking for in a wall sconce, a wallchiere is probably not for you. The term “wallchiere” comes from combining the terms “wall lamp” and “torchiere,” and this combining of names may give a good sense of what the wallchiere looks like. Wallchieres offer many of the benefits of torchiere lamps without taking up floor space. Wallchieres tend to be tall and slender and contain decorative elements that may not be found in other types of wall sconces. Wallchieres, like torchiere floor lamps, tend to direct the light up towards the ceiling. This upward direction of light works well in a bathroom, on either side of a vanity or over a large piece of furniture. A half-moon sconce is a specific type of flush mount sconce. You might envision it as a large serving bowl cut in half, with the cut side mounted to the wall. Half-moon sconces are available in a variety of styles with Tiffany-inspired looks being popular. There are also many contemporary, low profile half-moon sconces available, so there’s certainly an option to fit your taste and your home’s style. Spotlight sconces are a particular type of armed sconce. As the term suggests, spotlight sconces allow you to adjust the light by moving the arm of the sconce to “spotlight” or light up one specific item or area. Spotlight sconces are often used as picture lights, mounted above a framed piece of art to highlight the artwork. Spotlight sconces also work well to provide a reading light when mounted over a bed. Additionally, many outdoor motion activated lights are spotlight wall sconces, aimed to light a particular area. This is in contrast to a half-moon or other flush mounted wall sconce, which is designed to offer a gentle wash of light over an entire wall. While many wall sconces like flush mounted sconces and wallchieres aim light upward, most spotlight sconce lights direct light downward and certainly concentrate light in a selected area. When you think of recessed lighting, you probably envision very low profile lighting installed and recessed into the ceiling. Recessed sconces are much the same, but recessed sconces are recessed into a wall, rather than the ceiling. Recessed lighting requires hard-wiring, so unless you are doing new construction or major rewiring, you may be somewhat limited in where you can place recessed light sconces. As you might imagine, corner wall lights are wall sconces specifically designed to fit into 90-degree corners of a room. A candle sconce is a wall sconce that either works as a wall mounted candle holder or as an electric or battery-powered light source that is designed to look like a candle holder. Centuries before electric or even gas lighting was available, many individuals used candle sconces as a light source in their homes. 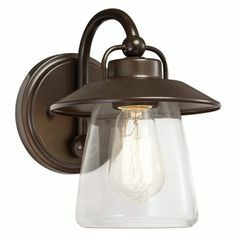 This type of sconce, then, is a vintage-inspired style. While this look may not be the right fit for some design aesthetics, it can work well in a formal, classic interior. The lightbulbs for electric candle sconces that mimic real candles can be somewhat difficult to locate, as they are a specialty type of bulb. However, these provide a distinct look that many homeowners prefer. Wall sconces for lighting are available in three basic design configurations: up light, down light and all-around light. These configuration options refer to the direction that the light it pointing. The configuration you choose is determined by the function you want the sconce to serve. Some sconces can even be installed to be either up- or down-lit, depending on the direction you choose to mount the sconce. An up-light sconce directs light upwards. This has the effect of making a room or area seem more spacious. Many homeowners choose up-lights for entryways, hallways and living rooms because of the expansive feel they tend to create. A down-light sconce, in contrast, makes a room feel more warm and cozy by casting light downwards. An expansive living room or bedroom can be made to feel homier by adding a down-lit wall sconce. Some sconces offer lighting in both upwards and downwards directions. This all-around lighting option has the benefit of creating a feeling of balance in a room. This may be the best sconce option if you want to add a lot of light to a dark room. Wall sconces are available in a variety of design options, from traditional to modern. Once you have determined the direction of lighting, the type of sconce and the power source you’ll be using, you are ready to think about the aesthetics of your new sconce. If you prefer a sleek, contemporary look, a modern sconce may be the choice for you. The emphasis of a modern styled sconce is more on function than form, and the look is often fairly minimalist. Often available in silver-tones, such as stainless steel, contemporary sconces work well in homes that have contemporary styling. Modern or contemporary style sconces are often either flush mounted or armed sconces, although you can certainly find modern looking sconces in other styles as well. As compared to modern sconces, traditional sconces tend to look quite formal. They tend to be more ornate, incorporating more design elements. A traditional wall sconce works well in a home that is more formal and traditional in design. If your design aesthetic is “shabby chic,” there is certainly a wall sconce for you. Whether you desire an up-lit, down-lit or all-around lit sconce, you can find a cottage-style light for your needs. Country style sconces are typically marked by their homey, cottage-inspired design elements and can be a lovely addition to any room with this style. Rustic design sconces differ from cottage designs in that rustic designs offer a more cabin-inspired look. If you are all about the “lumberjack chic” trend, then a rustic sconce may be perfect for you. More casual than many designs, rustic sconces work well if your décor is cabin inspired. In addition to design styles, sconces are available in a number of materials. The material of which a sconce is made will affect its look, so you certainly want a material that fits with your aesthetic. You’ll want to consider the material and finish of the sconce itself as well as the shade. Like any lighting fixture, wall sconces are available in a number of materials and finishes. Bronze finishes are particularly attractive and on-trend, with chrome, satin nickel, white, black and pewter also being popular choices. Like many lampshades, wall sconces are typically made with glass, fabric or metal shades of some sort. Paper shades are a popular choice as well. While wall sconces are a beautiful option for indoor lighting, they are also used as outdoor lighting. Remember, a wall sconce is simply any lighting fixture mounted to a wall, rather than overhead. Like, indoor wall sconces, outdoor wall sconces are available in a variety of styles and finishes, making them both functional and beautiful. Some wall sconces double as security lights, particularly motion sensor floodlights. One popular option for outdoor wall sconces is the lantern-style sconce. These work well when a pair is mounted on either side of a door. Lantern sconces mirror the look of a traditional lantern and work well on the exterior of traditional style homes. Barn lights offer another practical yet beautiful option. They are generally less formal in style than lantern-style sconces and pair well with a more casual style of home. Floodlight wall sconces may be less aesthetically pleasing than some other options but tend to offer a much brighter light source than many other outdoor wall sconces. Floodlights create intense lighting with a broad but focused beam. If you want to fully light up your backyard, floodlights may be a good option for you. LED lights are long lasting. LED lights are considered environmentally friendly, as they use less energy than many other types of lighting. LED lights can offer focused lighting, allowing you to spotlight something. Many homeowners choose motion sensor wall sconces for security lighting. Although this is not always the case, many motion sensor lights are floodlights, strongly lighting the particular area where movement is detected. The biggest benefit of motion sensor lighting is that it alerts you when there is movement in a particular area, adding security to your home. Motion sensor lights additionally offer convenience. If you come home late and cannot find your keys because it’s too dark, motion sensor lights can be a lifesaver. Motion sensor lights also save on energy—the lights only come on when you need them, then shut off on their own. You are not running the lights and using electricity when you don’t need to. Motion sensor lights often have adjustable settings. You probably don’t want your lights to come on every time a rabbit, raccoon or the neighbor cat walks through your yard. Many motion sensor lights allow you to adjust the settings so that these kinds of movements are not registered by the light if you don’t want them to be. Certainly, there are other types of wall sconces available, such as bulkhead lights, for your outdoor lighting needs. And much of what is true for indoor wall sconces is true for outdoor wall sconces as well. They are available with various power sources and configurations for different lighting needs. Some outdoor wall sconces are even solar powered. Here are some other important factors to consider when considering wall sconces. As with any lighting fixture, one significant factor to consider is how much light you need and what exactly you are choosing to light. Wanting a gentle wash of light across a wall requires a very different wall sconce than wanting a bright, focused light source for reading or crafting. Another important consideration is the room and the effect you are creating with your wall sconce. For example, many homeowners choose wall sconces for either side of a mirror over a vanity in the bathroom. Overhead lighting can create shadows on the face, which is not ideal when grooming, but a wall sconce on either side of a mirror can solve the problem. However, it should be the right sconce. A spotlight sconce may not be the best choice. Are you seeking intense, bright lighting? Or do you want to create a particular effect? Up-lighted, flush mount wall sconces can help make a small, dark room feel more open and airy, while down-lighted sconces can make an overly large room feel cozier. The installation of your new wall sconces can vary, depending on the type of sconce you select. While a battery-powered sconce may be easy enough to install and mount yourself, you may want to consider hiring an electrician for a hardwired sconce. In part, your installation choices may be dictated not only by the type of power source you select, but also by your budget and your DIY know-how. Certainly, replacing an existing sconce is easier than installing something totally new. This is probably something you can do on your own. The cost of a new wall sconce can vary widely. Depending on the sconce you select, you can expect to pay between about $40.00 to $10,000.00. Generally, battery-powered and plug-in sconces tend to be slightly less than hard-wired sconces, but this is not always the case. You should also consider what types of lightbulbs your selection requires, how readily available these are and how often you can expect to have to replace them when considering wall sconces. Before deciding on a wall sconce, you should also consider installation costs. 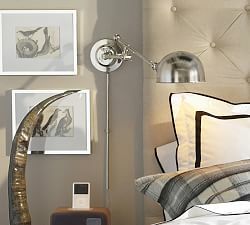 If you have your wall sconce professionally installed, you can expect to pay anywhere between $250 and $300 per sconce. The installation, then, can add a considerable cost to adding a wall sconce to your home and should be included in your budget.